Utah is almost half the size of California but is home to 5 national parks and a national monument: 1) Zion National Park 2) Bryce Canyon National Park 3) Canyonlands National Park 4) Capitol Reef National Park 5) Arches National Park and 6) Grand Staircase-Escalante National Monument. The Narrows hike in Zion National Park. Zion National Park is famous for its towering canyon walls, slot canyons, rivers, natural arches, and of course the hiking trails throughout it. The Angels Landing hike is well known for its incredible views and sheer dropoffs. Chains are bolted to the rock to keep you steady. Angels Landing hike in Zion National Park. Famous hoodoo rock formations in Bryce Canyon National Park. Hoodoo rock formations are formed by alternating layers of hard and soft rock (National Park Service, “Hoodoos”). The formations are made up of red, orange, and white colors creating unique, breathtaking views. Popular stops include the Bryce Canyon Amphitheater and the 1.3 mile Navajo Trail loop. In the Horseshoe Canyon section of the park, many petroglyphs can be seen. The park is named for its dome-like features found on some of the cliffs. 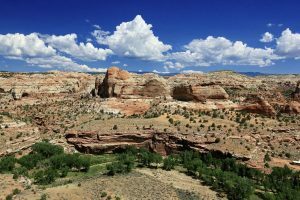 Capitol Reef offers a range of day hikes, as well as backcountry hiking for those looking for more of a challenge or secluded areas. Before or after your stop at Canyonlands, explore Arches National Park located just 5 miles north of the outdoorsy city of Moab. Close to Kodachrome Basin, Escalante is another awe-worthy stop. This expansive area was established as a monument in 1996. Utah is a small but mighty home when it comes to parks. In addition to the above 6, there is also Kodachrome State Park (36 miles from the lodge), the Northern rim of the Grand Canyon (100 miles from the lodge), and Lake Powell (130 miles from the lodge). Happy exploring!